Based on the response to the quilt I made from Juniper's baby clothes, a lot of you feel just like I did before I started: like you want to make a quilt or just get figure out how to use your sewing machine that hasn't done anything but gather dust in your basement for the last few years, but you're overwhelmed and not sure where to begin. I have the perfect project for you: a doll quilt. Although Juniper's quilt was technically my first project, before I finished it, I made a doll quilt so that I could practice binding the layers together on something smaller. I loved how it came out, and so I made several more. I think it makes a great beginner project before tackling something bigger. Lastly: you need a special foot for your sewing machine. I can't figure out the technical term for this is (please feel free to tell me in the comments, experienced quilters) -- but just throw yourself on the mercy of the lady working in your specialty quilt shop, and she'll show you what you need. You want a foot that helps the three layers of fabric (quilt top, batting, and backing) move along smoothly when you quilt it together. The lady in the store will know what you're talking about. Get the one she tells you to buy. To make the quilt, cut the fabric into smallish shapes, and piece them together. I'm not precise about this but you certainly could be. I kind of make it up as go, laying the fabrics next to each other to see what looks best to me. Once you have a quilt top you're satisfied with (mine are generally about 2 or 3 feet in length and width), cut the batting and fabric you want to use on the back (backing) to size of your quilt plus a few extra inches on each side. The backing can be a fabric you used in the quilt top or something more snuggly like a corduroy or flannel. Next, get out that quilting foot thing, and start sewing them together. You can quilt in a pattern, but that is too fussy for me, so I just tend to sew back and forth within each shape, or sometimes go in a circle. Experiment, and see what looks best to you. When you're done quilting the layers together, it's time to make the binding. Binding is where it pays to be precise, so don't trust me to tell you how to do it. Get a cheap quilting book from the sewing store, and read the directions. 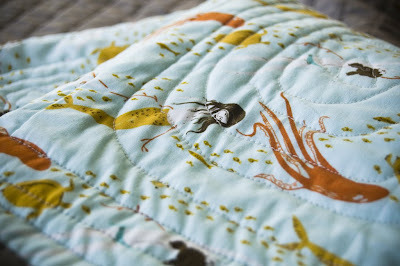 It sounds tricky at first but it isn't so bad, and ends up being one of my favorite parts of the quilt. Juniper loved this mermaid fabric so much that she begged me to make a doll quilt for her when I finished making one for her friend's birthday. I was happy to do it, because the fabric was a gorgeous orange and blue and the finished quilt is probably the only thing she possesses that isn't pink. 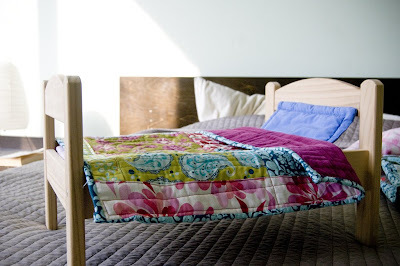 A doll quilt is a small project you can complete in an afternoon or two. It doesn't have to be perfect, and it might even look better with some crooked edges and mismatched seams. And if you have a girl (or a boy) under seven in your life, chances are she is going to love it. Doll quilts were my go-to gift this Christmas, and I think all of the kids were pretty pleased with them. I forgot to take pictures of a few that I made, so if any mothers of recipients out there (Amy, I'm looking at you) want to take a picture and send it to me, I'll post it here. The "special foot" is called a walking foot. It's also helpful when dealing with denim, leather or any other type of thick fabric. I've always wanted to quilt! I don't have a sewing machine, but I've seen them at Value Village. Don't know much about used sewing machines, but if you could find any info on what's good to have in a decent sewing machine, I'd love to see that post some time. I'm good with a needle and thread, but I suspect that'd take forever to work a quilt with. I don't have a ton of knowledge about what's good in a sewing machine, but I will say that older machines last so, so, so much longer. A lot of newer machines (unless they're high-end) have plastic interior parts that just wear out. I went through THREE new sewing machines while in college (mid-'90s) and finally dragged my grandmother's 1974 Kenmore out of my mom's attic. I'm still sewing on that machine, and I sew through everything; fabric, leather, vinyl, paper, cardboard, even astroturf! That's so beautiful. I'm really glad you'll be showing us your sewing projects. I've been so lax about sewing and knitting, except for the many little aprons I sewed for nieces and such this Christmas. You're inspiring me to get out the machine again. My excuse has been having a 9 month old, but clearly you have managed to find some time with two little ones. Can't wait to see what you share with us next time. I'm excited about WoodCraft! I happen to be making a doll quilt this week myself. Thanks for the inspiration. Beautiful quilts! I love the current crop of fabrics. I use a darning foot too for swirly quilting. It works really well. 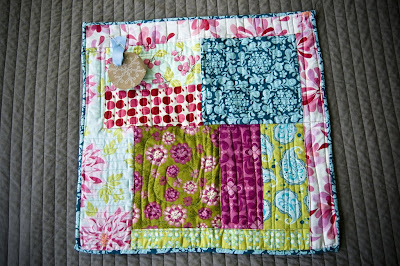 doll quilts are so fun! they're the perfect non-threatening size. I made a bunch to decorate my daughter's room and was so happy with how it turned out. I think this was just the inspiration I needed to get started making a little quilt for my girl. I loved your idea of using old clothes and blankets that your daughter had as that way the quilt would be full of memories for you and your child. I like that you approach it in a very laid-back manner as I think I would go crazy if I had to follow a pattern. I can sew, but I just hate following directions! Nice work! I borrowed my mom's sewing machine to make my Christmas presents this year, too. Now I want one of my own, for sure. Love the little quilt idea, thanks for breakin' it down. And the fabrics are yummy. That mermaid fabric is the bomb! Funny enough, I've been browsing around craft blogs this past week and just yesterday decided that, yes, I'm going to find my old sewing machine (in parents' garage, yikes!) and make a quilt. I think I might try making some placemats first? Even smaller than doll quilts! I'm really looking forward to your posts now! Sweet little doll quilts, Wood! 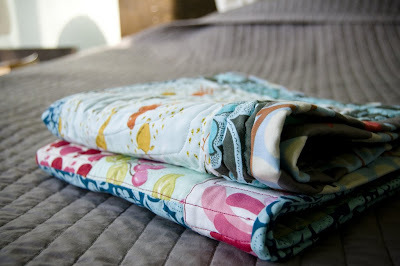 Here's a link that shows you how to bind your quilt. I got a sewing machine for my birthday 3 years ago, because I was going to make Kaitlyn a baby quilt. Which I never did. I always thought you had to sew the top and bottom wrong sides together, then turn it inside out so the seams don't show? Does that not matter? You really are making me feel like I don't have to be scared of my sewing machine! Oooo how exciting! And timely. My 7-year-old daughter and I have spent the last week or so embroidering a menagerie of of insects on scraps of fabric and were just this morning talking about turning them into a doll quilt for a sweet tiny girl in our lives. 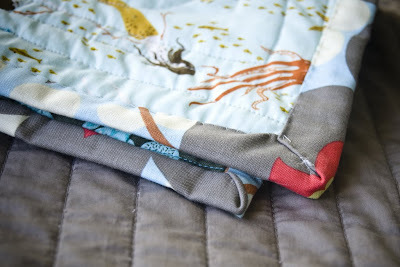 oh, the joy of diy sewing- i can't wait to have a little spare time again- i just love the quilt you made up for juniper and we love quilts here, have so far relied on kindness of family and strangers for them!! love this new venue for you, wood! Even this post isn't enough to get me away from my books and computer to sew something. I've had a little used Singer machine for over 20 years. It's still in the closet. Maybe I need to find it a good home as my house isn't a crafty house (for me). My husband does Needlepoint... amazing beautiful needlepoint. I'm not the crafty one. I love reprodepot too for fabrics and you can never do enough quilts. This came out so well Wood and the combination of fabrics is beautiful. I just finished a twin size, which I had never done and there is such a satisfaction in completing something like this. Wood, these are beautiful! I look forward to seeing all your crafty goodness. Oh I'm so jealous you ran into the Crafty Planet!! We relocated to the NE from Minneapolis a year ago and I have YET to find any store that compares - in a great big artsy city! Have fun! heather ross is my absolute favorite fabric designer. she is of the mermaid patterns and so many others. and she has a book coming out soon. you might really like it.